The speakers' bureau I work with -- the wonderful Speakers' Spotlight -- has updated their page about me. 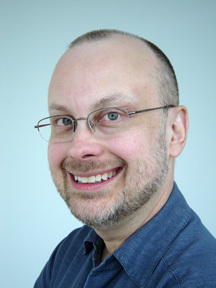 Robert J. Sawyer of Mississauga, Ontario, is one of only sixteen writers in history to win the science-fiction field's top two awards: the Hugo Award for Best Novel of the Year (which he won for The Terminal Experiment) and the Science Fiction and Fantasy Writers of America's Nebula Award for Best Novel of the Year (which he won for Hominids). He gave the keynote address at the 1997 Annual Meeting of the Canadian Authors Association, and wrote the article about science fiction for The Canadian Writer's Guide: Official Handbook of the Canadian Authors Association. 1. When do you think is a good time for a writer to create his or her web site? You need a website a few months before your first book hits the stores. Prior to that, it doesn't really do any good -- no one is going to go looking for it. Yes, there are occasional stories of writers who have posted work on the web, and then found a traditional publisher via that route, but that is about as common as winning the lottery -- and, just as likely, a print publisher will say they don't want your book now that it's been given away on the web. 2. What features are necessary? What unnecessary features do you commonly see on other writers' web sites? Most necessary of all: an easy, memorable URL. I have both sfwriter.com and robertjsawyer.com registered, with both pointing to the same website. When I started out, my website was at ourworld.compuserve.com/homepages/sawyer -- and, quite rightly, no one went to see it; my buddy Kevin J. Anderson made his wordfire.com about that time, and I realized I needed something short and sweet, too. Don't use a name that's tied into your current book, though. My friend John E. Stith did that with neverend.com back when his current novel was Reunion on Neverend, but now that's hardly the book people think of when they think of him. Unnecessary: a "welcome" page -- one of those silly "click here to enter" things; Flash animation or other visual distractions. 3. What three items are most important to place on a web site? You need: a bio; a good, publication quality author photo (linked from a smaller thumbnail) -- see mine at sfwriter.com/photo.htm; sample chapters; the book cover; and an email link for yourself. Everything else is optional. 4. How has your site help your career and exposure? It's been huge -- but, remember, I've had the site for over ten years now, and it's got over a million words of material on it. I sell thousands of dollars worth of copies of my own books through my website each year, have had speaking engagements and writing assignments worth tens of thousands of dollars come to me because of it, been quote in a page-one article in USA Today because of it (and been that newspaper's online edition's Writer of the Month because of it), and, of course, most important of all, attracted a lot of new readers. 5. What was the biggest hurdle in creating your site? in attraction visitors? Creating the website: zero hurdles. It's easy, inexpensive, and anyone can do it. To attract visitors you need to rank highly on Google. I wanted to make sure if anyone searched on either "Robert J. Sawyer" or "science fiction writer," they'd find me (it's searches on the latter that resulted in most of the good things I mentioned in the previous answer). Learn to use Meta tags (keywords embedded in the code for your web page), and make sure you frequently repeat the terms you want Google to rank you on. Look at my main page at sfwriter.com and count the times "science fiction writer" and "Robert J. Sawyer" appear; there are times when an easier flow for the text might have suggested me writing "SF writer" and just "Rob," but I don't do that -- I hammer the terms that I want Google to find. The only individual science-fiction writer who has a page rank higher than me on Google right now is Robert A. Heinlein, and I'll gladly take a back seat to him any day. Also, put your website name everywhere: on your book's jacket, in your "about the author," on your letterhead, and on your business cards (you do have those, don't you? -- if not, get some; mine are from vistaprint.com, but, for God's sake, pay the few bucks for the ones without their advertising on the back; you're a professional, not a pauper). 6. If you could caution a writer who wants to build a web site against one thing, what would that be? Last fall, I got invited to the Singapore Writers Festival, along with fellow science fiction authors Bruce Sterling and Norman Spinrad. Periodically, when we were out sightseeing in that beautiful city, people would notice our fancy name badges, or overhear us chatting about the festival, and ask who we were. At first we mentioned our books, but, of course, the titles elicited blank stares. And so I started simply pointing to Norman and saying, "This man wrote an episode of Star Trek." "Oh, wow!" people always replied. "Which one?" "`The Doomsday Machine,'" I said. And the appreciative nods began. Four decades on, and all over the planet, people still know and love Star Trek -- indeed, they know it so well that they recognize individual episodes by their titles. And of course, everyone is familiar with the catch phrases from the show: "Beam me up," "He's dead, Jim," "the Prime Directive," "warp factor six," "At the time, it seemed the logical thing to do," "phasers on stun," "hailing frequencies open," "Live long and prosper" and the most-famous split infinitive in human history, "To boldly go where no man has gone before." Those last words, part of Star Trek's opening narration, were first heard on September 8, 1966, when the debut episode was broadcast. In a way, that narration was hopelessly optimistic: it promised a five-year mission for the starship Enterprise, but Star Trek was taken off the air after only three seasons. But in another way, the words also turned out to be enormously shortsighted. Forty years on -- time enough for eight five-year missions -- Star Trek is such a major part of our culture that it's almost impossible to imagine the world without it. More people today know who Mr. Spock is than Dr. Spock; the prototype of the Space Shuttle -- still the most advanced spacecraft humanity has ever built -- was named Enterprise; our cell phones flip open just like Captain Kirk's communicator; and the original fourteen-foot model of good old NCC-1701 is on permanent display at the Smithsonian. To date, there have been five primetime television Star Trek series, a Saturday-morning animated Star Trek series, ten Star Trek motion pictures and hundreds of Star Trek books. And it all started when a former cop and airline pilot named Eugene Wesley Roddenberry decided that maybe, just maybe, television audiences were ready for some adult science fiction. His "`Wagon Train' to the stars," with its irresistible mix of gaudy sets, hammy acting and sly social commentary, has been warmly embraced now by two full generations of human beings. Granted, for the first time in two decades, there's no new Star Trek TV series in production, and, yes, there are no new Star Trek movies currently in the works. 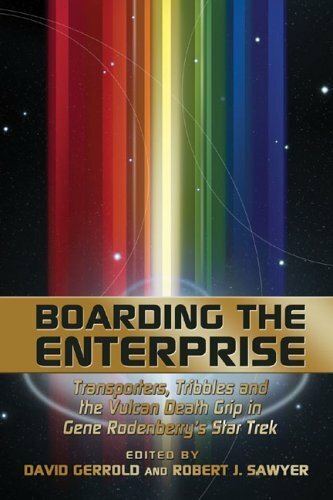 But if we've learned anything from the voyages of the Enterprise, it's that even death is not permanent. Star Trek, no doubt, will live again. And well it should: No TV series of any type has ever been so widely loved -- or been so important. Yes, important: Star Trek was the only dramatic TV show of its day to talk, even in veiled terms, about the Vietnam conflict, and it also tackled overpopulation, religious intolerance and race relations (who can forget Frank Gorshin -- Batman's Riddler -- running about with his face painted half-black and half-white?). As William Marshall, who played cyberneticist Dr. Richard Daystrom in the episode "The Ultimate Computer" (Season 2-Episode 24), said in an interview shortly before he passed away, it's impossible to overstate the impact it had in the 1960s when white Captain Kirk referred to the black Daystrom as "Sir." Was it any surprise, two decades later, that NASA hired Nichelle Nichols, who played Lt. Uhura, to help recruit the first minority astronauts? Star Trek gave us an appealing vision of a tolerant future that included everyone. And that future is still compelling. We may not be quite sure how to get there from here but, as Edith Keeler said in Harlan Ellison's episode "The City on the Edge of Forever" (1-28), Star Trek taught us that the days and the years ahead are worth living for. More than anything else, the series was about hope. To celebrate four decades of exploring strange new worlds, of seeking out new life and new civilizations, we've commissioned these commemorative essays. Some are by the people who actually made Star Trek: Norman Spinrad is here, along with D. C. Fontana, Howard Weinstein and my coeditor, David Gerrold, all of whom penned adventures of Kirk, Spock and McCoy that actually aired on TV. Other essays are by people like me: the current crop of science fiction writers who were deeply influenced by Star Trek, and at least in part took up our profession because of it. Still others are by academics who have found in those original seventy-nine hour-long episodes much worth pondering. Together, in these pages, we celebrate Star Trek with all the over-the-top gusto of Jim Kirk, we analyze it with the cool logic of Commander Spock, and we explore its fallible, human side with the crusty warmth of "Bones" McCoy. The first-ever book about Star Trek was the phenomenally influential The Making of Star Trek, published in 1968 when the original series was still in production. Written by Stephen E. Whitfield and Gene Roddenberry, it made possible the Star Trek fan-following that exists today, providing us with photographs of the props that were only glimpsed on screen, official biographies of the characters, blueprints of the Enterprise and the Klingon battle cruiser, and the first ever Star Trek episode checklist. That book ended with these words: "Whither Star Trek? It really doesn't matter. We have its legacy ... all we have to do is use it." After forty years, we still don't know where Star Trek is going. But one thing is sure: it'll be a wondrous journey. So, come on aboard -- we're about to leave orbit. Mr. Sulu, ahead warp factor one!